In a previous article I mentioned using RStudio as a development environment for Spotfire TERR (TIBCO Enterprise Runtime for R). For those of you using Spotfire and not using TERR, it’s an incredibly powerful feature you really need to add to your toolbox. It effectively gives you the ability to use every type of analytical function and data manipulation process ever developed. From Latent Factor Clustering to scripted ETL – it pretty much does it all. However, trying to develop code inside the Spotfire TERR console can be a bit of a pain. Why? Because you have to click through three menus to execute the code, then if there is an error, you have to parse through Spotfire and TERR’s errors to find the cause. Therefore, it makes sense to develop in an IDE (such as RStudio) then copy paste your code into Spotfire. Plus the Open Source version is completely free so you have no excuse. Get it here. There’s a whole bunch of little configuration tricks we can discuss, but that’s for another article. Here’s how you do it on Windows 7. 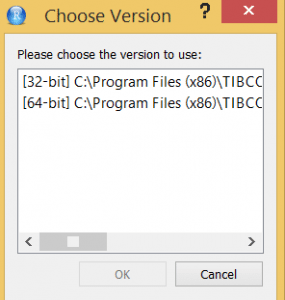 Here’s how to for Windows 8. 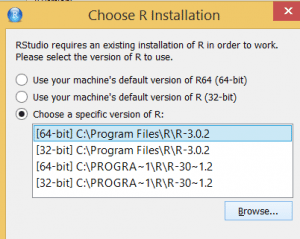 Now assuming you have successfully installed RStudio and you have Spotfire installed on your local machine (Again, why are you reading this if you don’t have Spotfire?) 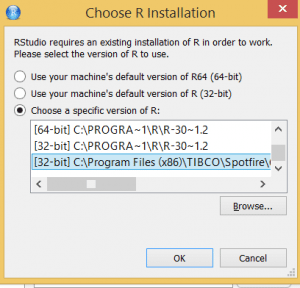 you can locate the application Spotfire uses to process R code – The TIBCO Enterprise Runtime for R engine. With [SPOTFIRE VERSION] as the version of Spotfire installed on your computer and [TERR VERSION] the TERR version you are currently running. If you can find the directory …TIBCOSpotfire[SPOTFIRE VERSION] but you can’t find “Modules” That directory is still hidden, stop skipping steps, go back to step number two and try again. RStudio defaults to a local instance of R. You probably installed it when you installed RStudio. But we need to point RStudio to TERR not R.
We verified the location of TERR in step three, so now we need to tell RStudio where to find TERR. When RStudio restarts, take a look at the console. It will tell you what version of R, or in this case TERR, is running. 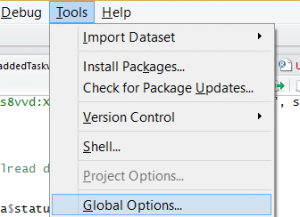 If you see “TIBCO Enterprise Runtime for R..” then you are successfully running TERR in RStudio! Yay! Learn even more about TERR by getting our latest Ebook!